The 33 heads of state discussed the war on drugs, energy, trade, and the United States’ ongoing embargo on Cuba. Deep disagreements over certain issues underscored America’s waning influence in Latin America. “I feel that the agenda of the U.S. and the agenda of Latin American countries, instead of moving in parallel to each other, or converging, are taking paths that separate them, that distance them,” said right-wing president of Guatemala, Otto Perez Molina. The war on drugs drew the sharpest contrast among the leaders, with the U.S. on the defensive over how to deal with drug trafficking. Many analysts see the recent united and open criticism of U.S. drug policy as a watershed moment in regional politics concerning prohibition. Only Canada fully backed the U.S.’s position of maintaining the status quo. “The prohibition paradigm that inspires mainstream global policy today is based on a false premise: that global drug markets can be eradicated,” said Molina, who was recently elected in November. He and other officials called for a global approach that regulates the consumption and production of drugs like tobacco and alcohol. Absent from the meeting was president of Cuba, Raúl Castro. American officials insisted on excluding the sole communist-led nation in the Western Hemisphere ahead of the gathering. President Rafael Correa of Ecuador boycotted the meeting over the issue, calling Cuba’s exclusion “intolerable.” Hugo Chavez, who was receiving medical treatment in Havana, sent Foreign Minister Nicolas Maduro to head the Venezuelan delegation. 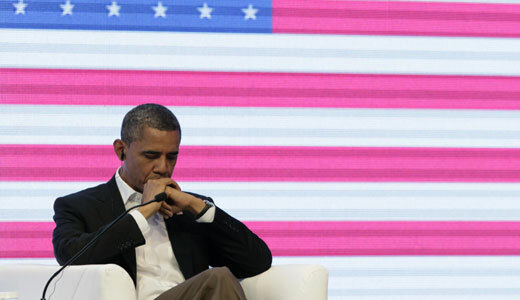 Obama received heavy criticism over his decision to bar Cuban representatives from the summit. Latin American leaders, including the host and long-time U.S. ally, Colombian President Jose Manuel Santos, vowed that Cuba will participate in future Summits of the Americas. “This is the last Summit of the Americas unless Cuba is allowed to take part,” Bolivian Foreign Minister David Choquehuanca told the Associated Press. There was no joint political declaration at the end of the summit. A declaration of support for Argentina’s claim on the Falklands/Malvinas Islands, which the U.S. opposed, failed after hours of negotiations. Venezuela, Argentina, and Uruguay refused to sign the final declaration due to the U.S. and Canada’s veto of Cuban participation in future summits. The rise of leftist governments and China’s growing influence in the region has made it difficult for the U.S. to maintain its hegemony in the region. Ever since 1995, when then-President Bill Clinton hosted the first meeting in Miami, the U.S. has been unsuccessful in its attempt to create a hemispheric free-trade area. In spite of these deep disagreements, officials called the summit a success. The leaders did agree on greater energy integration, student exchange programs, and expansion of broadband Internet access in the region. Initially, the summit was marred by controversy when eleven U.S. Secret Service agents were sent home for alleged “misconduct” involving prostitutes in a hotel. Five military service members may have been involved in the incident, according to the U.S. Southern Command. Although they could not come to a consensus on the final declaration, Santos said the leaders agreed to meet again in Panama in 2015 and that “hopefully within three years, we can have Cuba” at the summit.